7 Days in Costa Rica! You will not only get the chance to see the some of the best Waterfalls in Costa Rica but also visit Arenal Volcano, Monteverde Cloud Forest and Samara Beach. 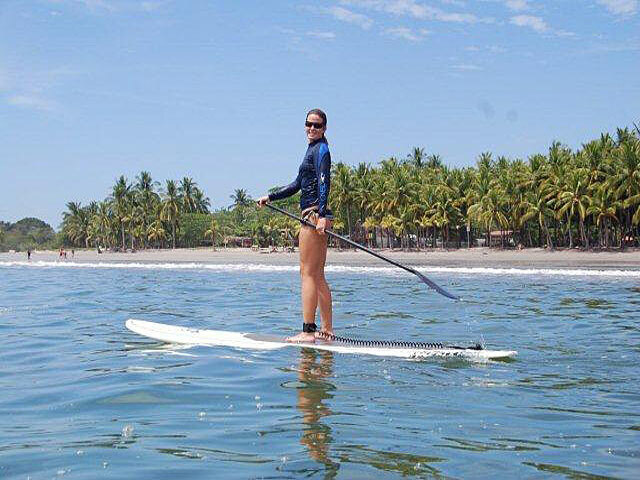 A high quality, affordable, Costa Rica Vacation Package. A package that can be customized for all levels of adventure and budgets. Price starting at: $1,179 per person. The tour includes all breakfasts and some lunches. Pick up at your hotel in San Jose (we can arrange your hotel for you) or San Jose Airport and travel for about 1 hour to La Paz Waterfall, near Poas Volcano, where you will walk through trails and see 5 different waterfalls, visit their butterfly observatory, humming bird garden, serpentarium, frog exhibit, trout lake, and end your day with a buffet lunch in the middle of the forest. Night at Arenal Hotel. Relax at your hotel which has its own hot springs! (the price is based on Arenal Volcano Lodge & Springs but we can work with many other hotels in Arenal such as Hotel Manoa, Los Lagos, Arenal Springs Resort etc). 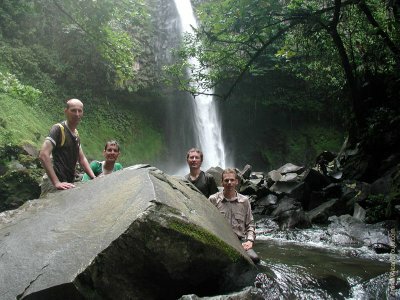 Today you will do 2 different tours and see great waterfalls in Arenal Volcano. Wake up early and try out our Canyoneering Tour! 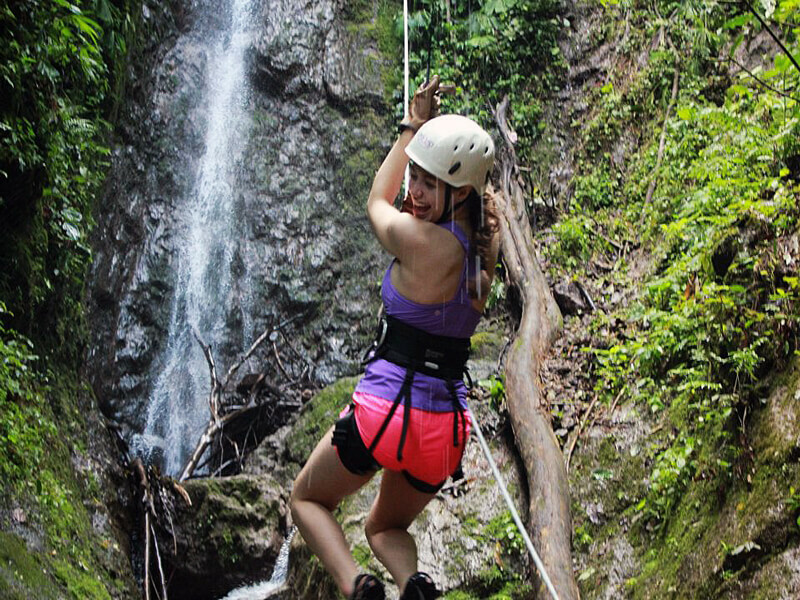 Rappel down great tropical waterfalls and hike in an isolated canyon near the Arenal Volcano. The tour starts with a 15 minute fun 4x4 off road adventure on Costa Rica’s famous bumpy backroads. When you arrive our friendly guides will give you a thorough safety talk about important rappelling & down-climbing techniques. You’ll use high-quality technical climbing gear such as a harness, helmet and gloves. To begin with, you’ll practice your first descent on a small, 10-ft waterfall and as you go on the canyon waterfalls get gradually bigger & BIGGER! We finish this tour with an all you can eat delicious home cooked lunch. Get spectacular views of the Arenal Volcano as you travel to the 140-foot Río Fortuna waterfall. 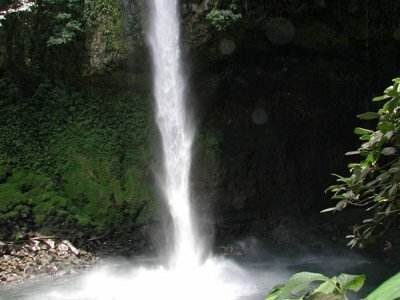 When we arrive at the parking area we will down climb to see the famous La Fortuna Waterfall. Although swimming is no longer permitted in this pool you can swim in the river a bit further along. At the base you will find huge rocks where you can sit and watch the falls and just relax or have a picnic. Today we will visit the stunning Rio Celeste Waterfall. Our journey begins with an early morning scenic drive for about 1.5 hours through rural Costa Rica. We’ll stop for a break for at a supermarket where you can buy a snack to take along the way and continue to Volcano Tenorio. When we arrive to Rio Celeste National Park we use the facilities and get ready for a 3 mile intermediate hike. 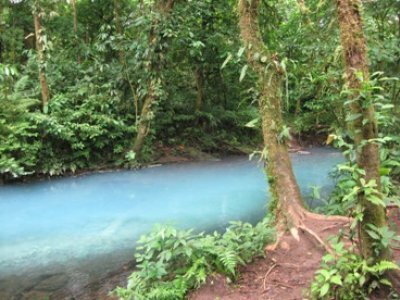 Our first stop will be at "Los Teñíderos" where two rivers come together to form the celestial, turquoise blue water color that gives the waterfall its name "Celeste." Our next stop will be at "Ollas” and those who want can relax in the natural hot springs. Finally we arrive to Rio Celeste and take some great pictures. People are not allowed to swim because of the minerals in the water. We end out visit with a typical lunch and drive back to your hotel. We now start the day we one of our Adventure Connections. The fastest and best view possible of the Arenal Lake towards Monteverde by Taxi-Boat-Taxi. The pick-up time is about 8.45am. The transport includes 25 minutes land transport from your hotel to Lake, 30 minutes by boat to cross the Lake and 1.5 hours from Arenal Lake by land transfer to your hotel in Monteverde. About 3-4 hours with stops, in total. When you arrive to Monteverde you will leave your luggage at the reception area (check in time is at 2.00pm but if your room is ready they might let you check in early). You will have time to have lunch at their restaurant or others nearby, before your pick up to take for an exciting Canopy Tour or Hanging Bridges in the Cloud Forests. Night at Hotel Ficus (the price is based on this hotel but we can work with many hotels in Monteverde such as Hotel Rustic Lodge, Hotel Belmar, Fonda Vela etc). 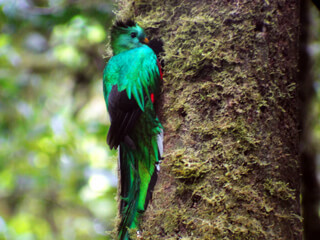 Guided Hike of the famous Monteverde Cloud Forest! 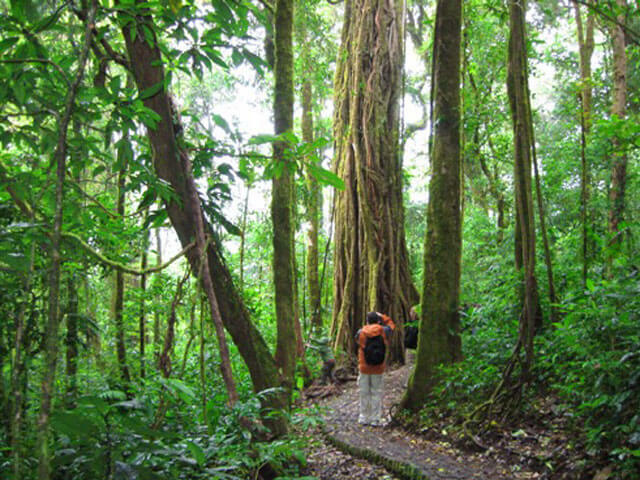 The Monteverde Cloud Forest Reserve was founded in 1972 by George and Harriet Powell and is the best known forest in the Monteverde Zone. In 1975 the initial 328 hectares of this Monteverde Forest reserve were increased with the addition of the Quaker communities 554 hectare water shed preserve. The reserve now covers around 10,500 hectares. Elevation ranges from 600 meters above sea level to 1800 meters on isolated peaks. This reserve, under the administration of the Tropical Science Center, is known world wide for its biodiversity and is visited each year by many tourists and scientists. The tour pick-up time is at approx. 7.00am and return journey is at 11.20am, everyday. The groups are usually small, and the guided walks are easy and takes about 2.5 - 3 hours with frequent stops to observe wildlife through the special scopes the guides bring. Note that during the rainy season trails can get muddy and a bit slippery so its recommend to take good hiking shoes. After the hike you will have time to visit the Hummingbird gardens and then we will head off to your hotel. You will have time to visit a local restaurant or bakery before we set off. Samara Costa Rica (Playa Samara) is in Guanacaste. This gem of a tropical paradise is on the sparkling waters of the Pacific Ocean. It has been designated as a Blue Flag beach which signifies its unique cleanliness and beauty. Samara is a small coastal town that retains its Costa Rican charm. The beach is known for its white sands and its picturesque setting and the pretty coral island located in the bay. Samara is still a working coastal community but has a good choice of amenities for tourists, such as fun tour options and restaurants. Night at a Samara Hotel (the price is based on Hotel Giada but we can work with many hotels in Samara so we help pick the best one for you! Your last full day on the beach! Here you can just relax or try one of our adventures and wildlife tours. What to Bring: T-shirts, shorts, long pants for riding, sweater or light jacket, sandals, light hiking boots, rain jacket, sun screen, insect repellant, any personal medication, swimming wear, towel, traveler's insurance recommended, full passport, and credit cards (VISA, Mastercard best - other cards can be more difficult to use in Costa Rica). NOTE: Adventure tours such as whitewater rafting, horse riding, kayaking, canyoneering and hiking require physical effort. Clients should be in good condition. For client safety and enjoyment, Monteverde Tours reserves the right to offer a substitution, postpone, change or cancel any tour due to unfavorable conditions. Full refund is given if (on rare occasion) a tour is cancelled by the operator. 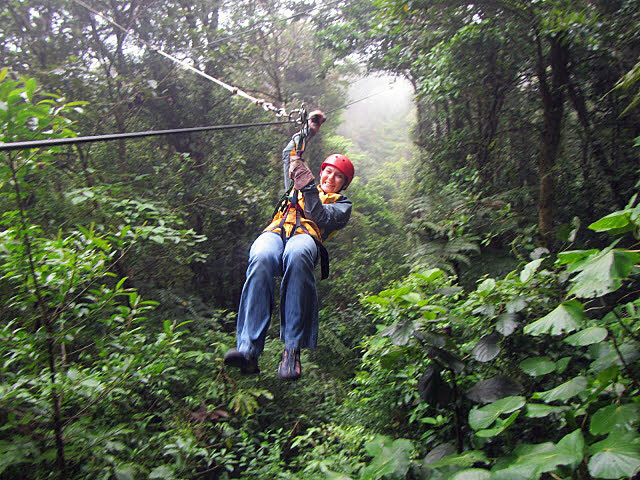 Monteverde Tours and its affiliates are not responsible for lost, stolen or damaged items. Free Day at the beach!